We’d love your help. 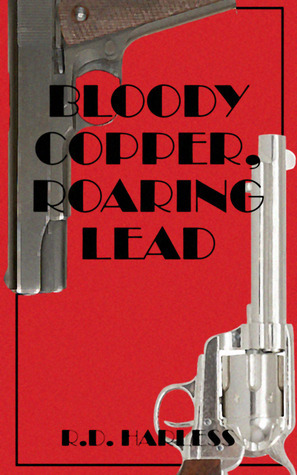 Let us know what’s wrong with this preview of Bloody Copper, Roaring Lead by R.D. Harless. To ask other readers questions about Bloody Copper, Roaring Lead, please sign up. What do you get when you combine a hard-boiled detective novel with a gritty western? If you're reading R.D. Harless' latest offering, you get a lot of fun. Horace Freem is as gritty as they come. A Chicago cop turned P.I., Freem is hired by a family with money to burn to find its missing son. The trail of Thomas Hendricks Jr. goes cold in Nevada where Freem, a city cop out of his element, has to rely on his wits and brute strength, to deal with a host of western bad guys. Freem's take-no-guff at What do you get when you combine a hard-boiled detective novel with a gritty western? If you're reading R.D. Harless' latest offering, you get a lot of fun. Horace Freem is as gritty as they come. A Chicago cop turned P.I., Freem is hired by a family with money to burn to find its missing son. The trail of Thomas Hendricks Jr. goes cold in Nevada where Freem, a city cop out of his element, has to rely on his wits and brute strength, to deal with a host of western bad guys. Freem's take-no-guff attitude doesn't serve him well with the desert-hardened souls of the west, but with the help of the likable-yet-dangerous Sam Penny, he tracks down every lead to find Hendricks' fabled copper mine and the family's $45,000. In a genre meld in which one could easily overpower the other, Harless blends both western and dark detective novel into one cohesive story that is both true detective, and true western. It keeps you guessing until the end, and it's fun to boot. If you're a fan of either genre, this is a novel that will make you a fan of the other. The title describes the book pretty well. A PI in 1920's Chicago is sent out West to the copper mines to look for a man who claimed to have struck it big and disappeared, with a suitcase full of money. Exciting mystery as the detective unravels the schemes of all the dangerous people he meets, enjoyed it. R. D. Harless is a husband and father currently living in Georgia. All work and no play makes him a dull boy, as evidenced by every page of the book he is currently working on. He enjoys referring to himself in the third person for internet profiles and may consider expanding it to everyday social situations in the future.